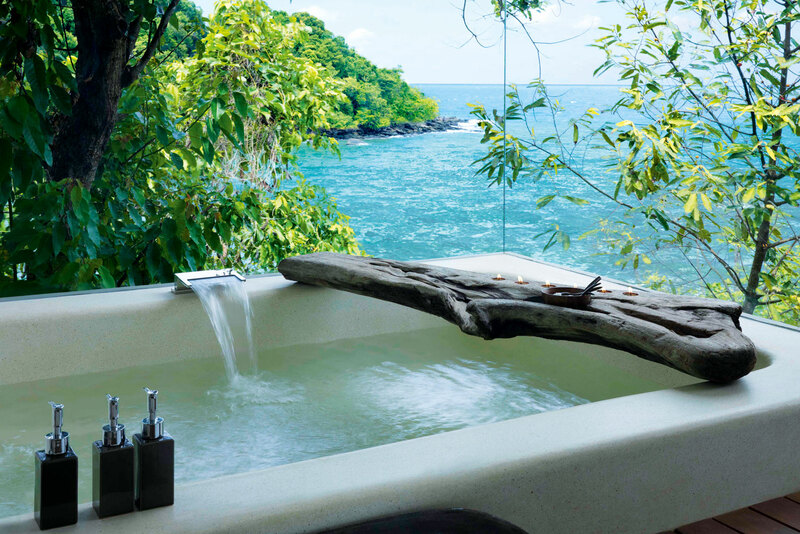 Bathtub with a view at Song Saa retreat, Cambodia. Translated in Khmer language as the ‘Sweetheart Islands’, Song Saa is Cambodia’s first high-end island getaway. Located thirty kilometres off-shore, Australian owners Rory and Melita Hunter took six years to make their peaceful low-impact but high-style retreat which comprises of 27 thatched villas constructed from local sandstone, driftwood and recycled building materials. Each is organic and deliciously comfortable, with private plunge pools and sun decks with gorgeous views and day beds shaded by driftwood twigs. Inside there are plenty of special touches: an espresso machine, sumptuous Ploh linen, complimentary mini bar and terrazzo bathtubs built for two. It’s the Hunters’ community responsibilities that really shine. Koh Bong is a preserve of nature trails and nesting boxes for hornbills, and the surrounding waters a marine reserve for seahorses, giant clams, and sea turtles; the breezy open-sided restaurant serves a sophisticated and very contemporary take on Khmer cuisine using only locally harvested fish and vegetables. The dry season, from November to March.